Excellent facilities very clean and good value. Nice clean place to stay. Near bus, train and shops. Town centre is just a short walk away. Perfect for what we needed. Close to train station, safe, modern, cheap, clean, quiet and the staff recommended some nice places to eat dinner and breakfast. Free wifi was good and the shower/bathroom did the job perfectly. For this price it does more than you'd expect! wonderful little hostel. 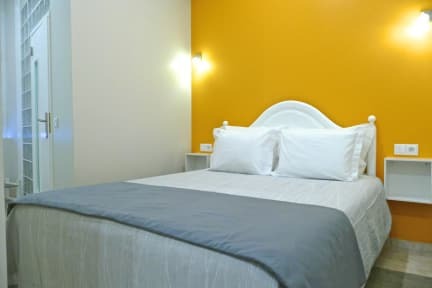 A very clean hostel with all facilities included. The location is great. The only negative is the rock hard bed which we were given. All I really needed for one night...characterless, beige, functional place...comfortable bed; poky bathroom; noisy aircon or something roaring below disturbed my sleep a bit, but otherwise all ok.
A good place to lay your head at night but not much more exciting in this hostel besides that. As we only had one day/night in Faro it would have been nice to know that the ferry to the 4 beaches out in the ocean was very cheap and easy to use. When we asked the hostel staff who checked us in what we needed to go she did not offer any suggestions which was disappointing. Luckily I brought I travel book with us. Hi, we were desapointed by this hostel. The personel was either unhelpful, unfriendly or just plain rude. There was No basic furniture. The closset smell really bad I recommend that theydo something about that (room #6). We could hear the bell of the door during the night when people came in. No basic cleaning or resupplying was done when we were there . We had to go to the reception for toilet paper in the middle of the night. We think that we could have a better deal to a hostel close by.